Dixon Stables Apprenticeship Program is a very intense program requiring dedicationand hard work. A strong commitment is essential and the reward will be great – for at the end of the program, you will feel a huge sense of accomplishment. To be able to communicate and connect with a horse’s mind is a beautiful thing. Through hard work and dedication, you can achieve what most horse lovers only dream of. The apprenticeship program is four "one week" periods, (this can be extended to four "two week" or four "three week" periods). Each week costs $500 per person with a $500 booking deposit required for scheduling. This nonrefundable deposit is necessary because of the time that is set aside exclusively for the apprenticeship program and will be deducted from the last session’s cost. All Training time is in the evening (to accommodate working people). You will get a min of 2hrs and max of 4hrs of time one on one with me (or possible one of the other trainers, as you choose) per day, 5 days per week. You will also get complete use of the riding facility and trails 24-7. Horse boarding will be provided and are included in the price. Each person is responsible for his/her own stall cleanings. Horses can also be provided if needed. 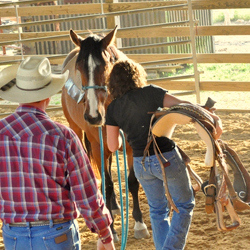 We have all levels from not-started colts to finished horses that just need polished up, or students can have their own horse for the program. It doesn’t matter if the horse is un-started or already trained because all horses in the program will be started from scratch. A negative Coggins test is required for all horses. Students that bring their own horse will have an opportunity to work with some of the colts in training, matched to your level.